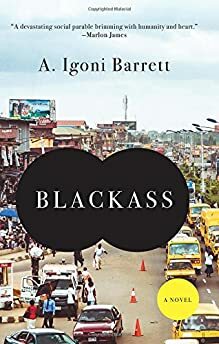 Largehearted Boy: Book Notes - A. Igoni Barrett "Blackass"
Book Notes - A. Igoni Barrett "Blackass"
A. Igoni Barrett's debut novel Blackass is a fierce comic satire that brings contemporary Lagos to life. "[Blackass’s] magical realism allows Barrett to probe society’s continuing bias [toward] whiteness, both explicit and covert; its allegorical ending proves that the writer’s two acclaimed short-story collections didn’t come close to exhausting his talent." Three odd years after my first response to the call of Largehearted Boy, my computer's music playlist hasn't changed much, neither has my habit of seeking silence while I write. The only music-related tidings I bear from this writer's life is that I'm growing surer as I grow older that I will never find the courage to fulfil my fantasy of becoming a superstar singer. I have the talent. I do, I do, just ask the neighbours who have never once come banging on my door to complain of my bathroom singing. They are my tried-and-tested audience, those silent neighbours, my long-suffering fans—especially during the initial eight-month stretch of pounding out the first draft of my novel Blackass, a time when I often forgot to wash until exhaustion sent me tottering into the bathroom at unholy hours to cool my head under the shower, to soap myself back to freshness, whereupon I would sure as rain begin to yodel along to the songs playing on my smartphone. And so, rather than inspiring my novel in any straightforward sense, these selected songs all claim spots on the bathroom playlist of my nightly breaks from writing. Many years after first discovering this Spanish-language masterpiece of mood music, I still hum along to it as I brush my teeth, and spit out toothpaste to yell, "Amor! Amor!" Fuji is a popular Nigerian traditional music genre that's a staple of Lagos weddings and naming ceremonies. It's also a common sound in the poorer neighbourhoods of Lagos as well in the loudspeaker bedecked mini-buses that the majority of Lagosians commute by. It's considered to be unfashionable music by Nigeria's yuppie crowd. Until, that is, Dare Art Alade released his hip-hop version of the music in the mid-2000s and had all the nightclubs in Nigeria—from west to east, from affluent Lekki to rough-and-tumble Oshodi—dancing dirty to this massive hit song. Track 15 from the aptly titled If You're Reading This It's Too Late came closest to displacing 2pac's "Dear Mama" from the singing part of my rapper's heart. Drake's songs are perfect as bathroom music, because everyone and their favourite rapper think they can do what he does, he makes it look easy. To unearth the taproot of soul music, listen to this Yoruba singer. "I Got a Story to Tell" – The Notorious B.I.G. The song that helped me forgive Biggie for that beef with 2pac. The plot arc, the wordplay, the Big Poppa attitude all came together to make this one a defining song from hip-hop's wildest years. From a maestro gone too soon, this is the song that contains the timeless line, "Freedom is just another word for nothing left to lose." That's how I feel whenever I sing along to any song on her greatest hits album: freedom to express myself, sadness at how much we lost. Her voice salts my bathwater. The title song from this manna-voiced Algerian singer's debut solo album. No words. Just listen. The melancholic piano opening. The angst-pickled chorus. The smattering of emotionally astute rap verses like ‘and I just blame everything on you / at least you know that's what I'm good at.' Everything about this song is like Kim to Kanye, a "be-mine-forever-regardless" kind of feeling. Otherwise known to countless lovers as "My Sweetie". The only problem with this tune is that it's so blithe and catchy that many times I've had to dig deep for the willpower to stop dancing in the shower. What's the connection between Archimedes, Marvin Gaye, Raymond Carver, and yours truly? This song. Granted, I wasn't in the bathroom when I saw the light, but why split hairs? The real discovery was this: one day, while listening to this sad love song on endless replay, I realised a) despite its rhythm-and-blues guise it was in fact a virtuosic short story; and b) to press home this point Marvin Gaye had given it a Raymond Carver-esque title. Eureka, eureka. I used to quip that this genius was one of those Faustian few who sold their souls to the devil. Then I listened to him play this, and thought, he must have cheated the devil. Miles had miles and miles of soul. This song is anything but. Actually, it's brilliant. With a voice that makes some swoon and others glower, this guitar-strumming singer spins enchanting music from the playground tunes and nursery rhymes of our Nigerian childhood. The Belgian god of music. Amazing doesn't even begin to describe the range of his talent. Believe Time Out New York when it states: "There's just nobody else like him in popular music right now." I have no excuse for why it took me so long to find Her Highness. True, she was part of the background music of my growing-up years, but she's moved to forefront, she's grabbed the podium now. No deeper truth has been uttered than when she sings, "For you are mine at last." From the bathroom to the grave.